During 1900-1926, Arch Creek became a town which included a train depot, a post office, a school, a church, packing houses, and stores. The community was basically agricultural, growing tomatoes, grapefruit, and pineapples. The Arch Creek community eventually disappeared. After the land changed hands a few times, it became a trailer park in the 1950s. Residents of this park planted many exotic plants that are now being removed. The property was eventually purchased by the Chrysler Automobile Corporation for a used car lot. The park has a museum containing artifacts left by natives who homesteaded the site as they passed over the arched bridge. 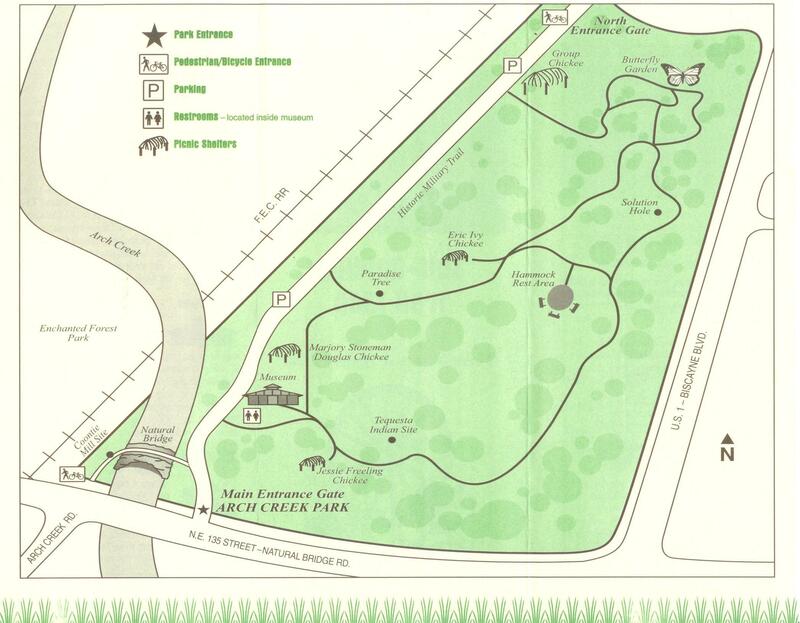 Miami-Dade Parks naturalists guide visitors through the park as they point out native birds, animals and insects and identify the variety of trees growing in the area. Arch Creek Park is designated as a Florida State Historical Preserve.